OAKLAND, CALIFORNIA - Stephen Curry backpedaled in pure joy. He skipped, hollered and let the ball fly from everywhere with that feeling he gets when there’s no way it will miss — unwavering even with a defender’s hand in his face. 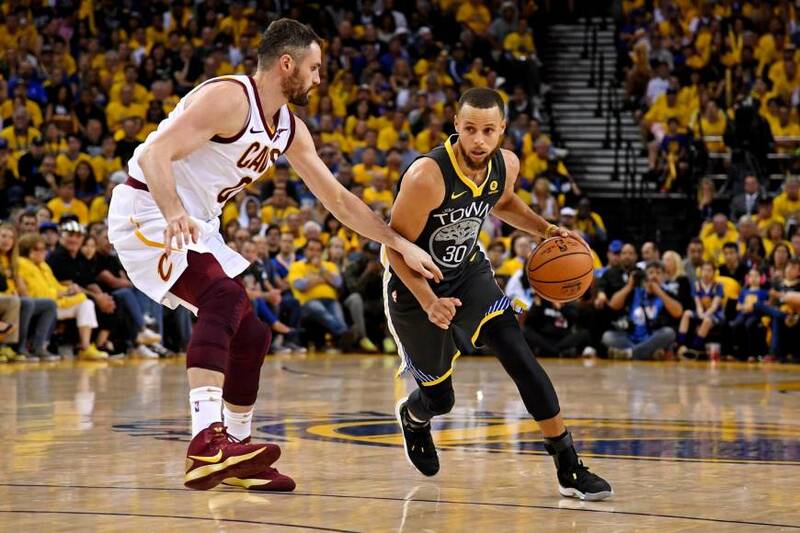 Curry dazzled in outdueling LeBron James as the two superstars traded big shots and celebratory moves, hitting an NBA Finals-record nine 3-pointers and scoring 33 points to lead the Golden State Warriors to a 122-103 victory over the Cleveland Cavaliers on Sunday night for 2-0 lead in the series. Kevin Durant found his steady stroke to score 26 points to go with nine rebounds and seven assists while also handling a load of the defensive assignment against James. Klay Thompson added 20 points playing on a tender left leg to bring the defending champions two wins from a repeat title they have talked about since the season began last fall. Curry had the shot of the night with 7:54 to play, making an off-balance swish from far behind the 3-point arc over Love as the shot clock wound down, then scooted backward in delight. Curry later fell into the first row of fans with a baseline 3, again over Love, and four-point play at the 5:44 mark of the fourth. The two-time MVP made 11 of 26 shots and was 9-for-17 from deep. 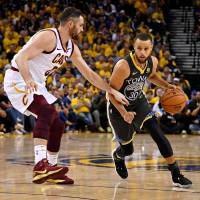 JaVale McGee scored 12 points, making all six of his shots in his first career NBA Finals start as Kerr made a lineup switch that proved to be spot on. The typically efficient Durant connected on 10 of 14 shots after going just 8-for-22 — 1 of 7 on 3s — in the opener but still scoring 26 points. The Warriors vowed to make it harder for James to generate good looks after he shot 19-for-32 in the opener. James went 10-for-20, showing few signs his shot was altered by a bloodshot left eye. He has been taking antibiotics and using drops after being poked in the eye by Green in the first half Thursday.